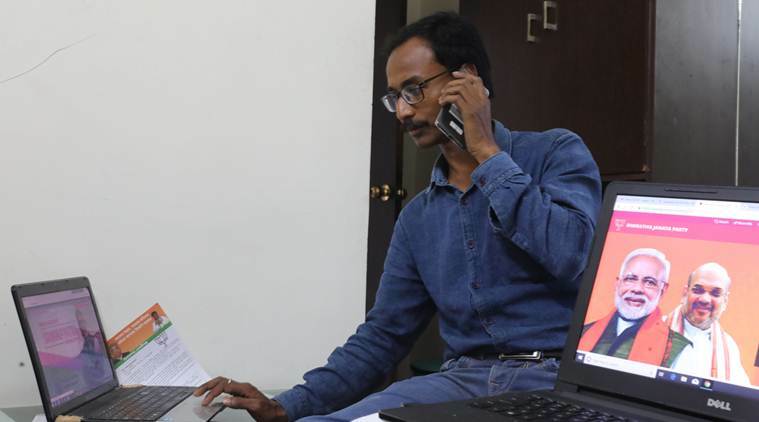 AT A political rally, inside the party office, at home or in the small pharmacy that he runs in Gopalpur village, Dipak Das is always on the edge, his eyes glued to his two cellphones, a battery charger on standby. For the BJP, this 36-year-old “IT yodha (warrior)” is a key player in Cooch Behar, which votes in the first phase of the Lok Sabha elections Thursday. “I am the party’s district IT cell convenor. Here, I am an admin in 1,114 WhatsApp groups, I manage the party’s Facebook page and I organise Twitter trends,” says Das. But that’s not all. He says it’s because of workers like him that his party is able to reach voters in “many places” where “social media is a silent weapon”, where “it is not physically possible for BJP to campaign because of the terror and supremacy” of the Trinamool Congress. “I am an admin in 229 groups on one number, and 885 on another. In each group, there are a minimum of 30 people and maximum of 250. The numbers change every day as some leave and others are added. But I have no time to waste from 6 in the morning… during the air strikes in Pakistan we worked 24 hours straight,” says Das, who is married with a five-year-old daughter. “During one of our early campaigns, we had gone door to door to talk about governance and the party. During that period, we got the numbers of all the smartphones in every family. We also got numbers during the party’s national online membership campaign,” he says. Das says he has completed Class 12 but could not afford to pursue higher studies. He joined the BJP in 2014 “for Narendra Modi” and was made the block general secretary. “In 2015, I bought an Android phone and started to campaign for the BJP in social media. This year, the party bought me a cellphone worth Rs 10,000 and a portable charger. It also pays my travel bills,” he says. According to Das, he was trained in social media by the BJP state IT cell in Kolkata. “I have even participated in a session chaired by party president Amit Shah in Howrah. He called us IT yodhas and gave us a list of dos and don’ts in social media,” he says. In Cooch Behar, Das heads a team of 40 in Cooch Behar, armed with cellphones and two DSLR cameras taken on rent. He is happy with this profile — except for a hitch or two. “I have a motorbike but I can’t ride it. I need to keep my hands free all the time and watch my cellphone. Once our party puts out a message, we support it, like it, share it and start trending it,” he says. Then, there are the covert operations. Das admits fake accounts are used to penetrate TMC groups. “But Trinamool has more of them. I have a genuine account and so have my colleagues. But there are some supporters who are scared to speak about BJP through genuine accounts. There are some whose accounts project them as supporters of Trinamool. They watch what the TMC team is doing and report to us. They also criticise TMC within their groups. TMC does the same thing with us,” he claims. “We have a wide network. They keep a watch, and send us pictures and videos of Opposition leaders and workers caught in scandals. Recently, someone posted a picture of a local Opposition leader in a compromising position. We immediately made it viral,” says Das. There’s also a method, he says, to “attract” more people to party accounts. “No one will follow you or become your friend on Facebook if you post only party messages. I share important news, too, and engage in debates on various issues. This attracts people. Then I post a few party messages,” says Das. The flip side, however, is that he has “received threats on social media” and his shop “was targeted by rivals once”. The key, he says, is not to engage openly in party campaigns, carrying flags. “ I work openly but many others do so behind the lines. We take the help of teachers and professors before we engage in social media debates. Personally, I even talk to some senior Left members in my area, who have now shunned politics, to learn more about national issues,” says Das.